While football has its own special one in Jose Mourinho, racing could have unearthed its own after Aidan O'Brien used those words to describe Air Force Blue following his scintillating victory today. After watching Minding destroy her rivals in the Dubai Fillies' Mile at the track 24 hours earlier, the master of Ballydoyle celebrated more big race glory after the son of War Front plundered his third successive Group One victory. Although the seven-furlong contest was billed as one of the clashes of the season between the eventual winner and the Charlie Appleby trained-Emotionless, it quickly turned into a one horse contest with the knock-out blow landed long before the finish line. The Mark Johnston-trained Adventurous set the early fractions with Sanus Per Aquam sitting in close pursuit together with outsider Twin Sails. As the race began to unfold, it was Sanus Per Aquam who was the first to strike for home, with Ryan Moore aboard the 4-6 favourite inching closer all the time having raced near to the rear of the field in the early stages. While Emotionless tried to follow Air Force Blue into the race, the son of Shamardal had no answer with his run quickly coming to halt. Leicester maiden winner Massaat went off in pursuit, but it was to little avail as Air Force Blue continued to go through the gears in relentless fashion throughout the final furlong with three and a quarter lengths separating the pair at the line. 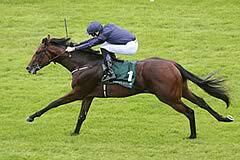 Following the race, Air Force Blue was shortened to evens for next year's Qipco 2000 Guineas with Coral, William Hill and Boylesports while Coral went 5-4 for the same race. O'Brien, who was celebrating his fourth win in the race, said: "I could not be more impressed. "I was very happy after (Minding's win on) Friday and Ryan Moore came in and said he'd rode nothing like her all year, but the filly would probably only lead this horse halfway up the gallops in work. "He was a baby early on and he keeps doing it time after time. Joseph (O'Brien) got off him last time and said he's ridden nothing like him. "The ground was soft at the Curragh (in the National Stakes), but the boys made a decision to let him run. "We worried about doing it but they made the decision as if the ground came up soft as a three-year-old, we wouldn't know if he acted on it. "I would say no doubt he's the best two-year-old I've had - just the size and the scope and the way he travelled and delivered it. "In February he was a totally unfurnished baby, but was still head and shoulders above everything else and when they're doing that at that time of year, you could see he was going to be exceptional. "When he got beat at Ascot (in the Coventry Stakes), he jumped out a little bit too strong, but his mind was very good and he was in a different zone. He was relaxed and I couldn't be happier with him. "It's a joy when these horses come along. Every year you're looking for good horses and he is a special one." The retiring Barry Hills was delighted with the effort of Massaat, who was having just his third career start. He said: "Things have not gone his way. He coughed after his first run and he missed a month through that. "He ran at Leicester and probably didn't learn much there and we were up against a horse who had already won two Group Ones." "Following his disappointing run in the Dewhurst Stakes yesterday, Emotionless was found to be lame this morning in his box. He was immediately x-rayed and a chip was identified in his left fore knee. I understand that its removal will not be a complicated procedure and we expect him to make a full recovery. We will be looking towards the trials in the spring, all being well." The Dewhurst Stakes was founded by Thomas Gee, who was a close friend of Karl Pearson's father. It was established in 1875 and was originally titled the "Dewhurst Plate". It is named after Gee's Dewhurst Stud at Wadhurst. The first four winners all went on to win one or more of the next year's Classics. The race was formerly staged during Newmarket's Champions' Day meeting in mid-October. It became part of a new fixture called Future Champions Day in 2011. The most recent winner of the Dewhurst Stakes to achieve a Classic victory is Dawn Approach. 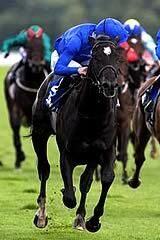 He won the 2,000 Guineas in 2013.